Like clockwork Lee County summer real estate sales are heating up. So why aren’t Lee County home sellers jumping for joy? Many home sellers are happy, because their home was on the market all season and now it’s selling. Others are happy because their home just sold while their neighbor’s home sits on the market. This past season we saw many sellers priced at one point while the buyer’s perception of value was at another. In many cases, the seller’s perception exceeded the buyer’s perception by 10% or more. Sellers didn’t want to accept this reality, so homes sat on the market. You’ll always have some sellers that refuse to accept today’s market prices, but when you have many, it causes the market to take note and listen. The market always speaks to us. It’s up to us if we’re ready to listen. We’re humans, and we don’t always want to accept change. For those that accept change and react quicker, the opportunity is the greatest. Right now, home sales are brisk $300,000 and below. This makes sense because that’s where the bulk of the buyers are. That’s what more people can afford. 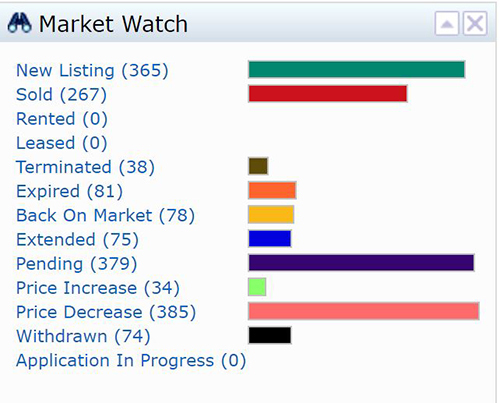 We just pulled up the 7-day market watch from MLS, and we notice there more pending sales (379) than new listings (365). You’ll notice too there were more price reductions (385) than either. These price reductions are leading to more pending sales as sellers get their home down to where the buyers are. Selling a home is kind of like fishing. If you place your bait 20 ft above where the fish are, you get nothing. Lowering the bait 10 ft above where the fish are still yields nothing. Fish tend to swim in schools. You’ve got to place the bait where the fish are, not where you want them to be. Pricing a home is the same. If you price your home above where the buyers are, they don’t even look at it. Typically, you should expect an offer with every 4-5 showings. If you’re not getting offers, your home is probably still overpriced. Sellers say, “We just reduced our price $10,000” so that can’t be it. It can. If you were $30,000 overpriced, that $10,000 reduction still places you 20 ft above the fish. Until you get down where the fish are, you’ll attract few showings and little to no offers. Of the 379 new pending sales, the median price was $249,000. The average price was $335,540. This confirms the $300,000 range and below as being the sought-after part of the market. If you have a home $400,000 or more on the market right now, you’re probably still fishing for the correct asking price. You may be wondering why buyers just are not accepting your price. Your neighbor’s home may be sitting on the market too. Occasionally one will sell, and you’ll be wondering what they did to attract that buyer. It takes aggressive marketing. Aggressive marketing alone won’t work. Together with your agent, you’ll need to adjust that bait until you find where the fish are. When you do, it will sell. 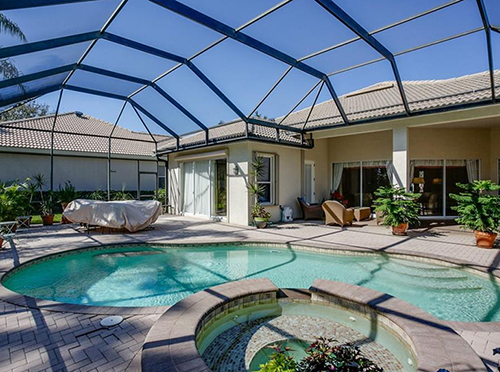 The SW Florida real estate market isn’t suffering from a lack of buyers. The buyers are not aligned with some sellers’ asking prices. When the seller gets down to where the buyers are, the buyers are biting. This past week or so the Ellis Team has placed 7 properties under contract. Some agents believe the summer is the slow time, but that’s a bad assumption. We have buyers in all price ranges. We just closed a property over $1 Million. The agents out there hustling are selling homes. It’s a great time to sell, so long as you’re willing to price your home at the market. Isn’t that always the case though? Together with your agent you should ask yourself, “Am I willing to price my home at a price that will cause it to sell?” If the answer is no, then why are you putting it on the market? If you’d like to talk to Sande or Brett Ellis about selling your home, call us at 239-489-4042 Ext 4. Next week we hope to share some exciting news that may make your home stand out and sell faster. Find out what your home is worth online. 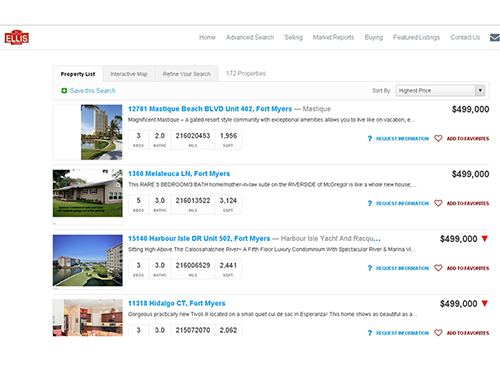 Search the MLS like a Pro! Get real-time updates, price changes, new listings, and All the MLS listings. What Does $500,000 Buy in Lee County Real Estate Market? We use the MLS to do our search but you can do the same and search like a Realtor at www.LeeCountyOnline.com and find the same homes. 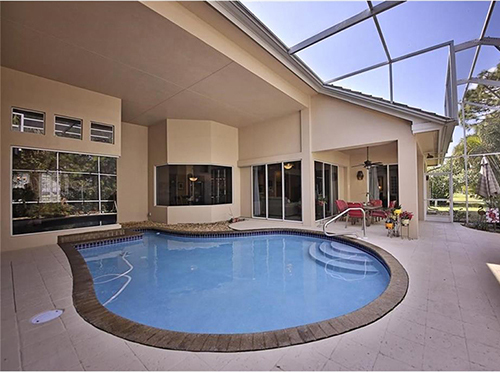 In Fort Myers we found a home in Carillon Woods listed for $498,000 that is 3 bedrooms, 3 1/2 baths and has a nice pool. The home is nearly 3,200 sq ft of living area and is in a gated community with sidewalks, street lights, tennis courts and playground. Carillon Woods is a very popular neighborhood in this price range. 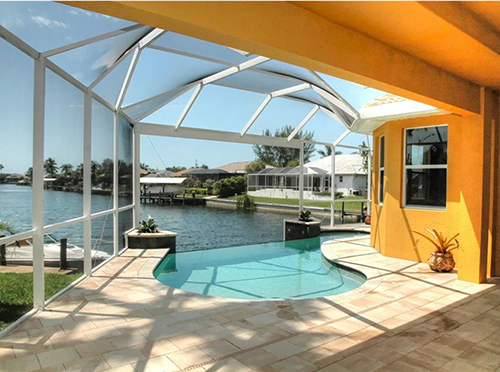 In SW Cape Coral we found a gulf access waterfront pool home with 3 bedrooms, 2 ½ baths and almost 2,500 sq ft living area on a 120 ft canal for $500,000. It has a 3 car garage and is only a few years old. We especially like the infinity pool on this home. 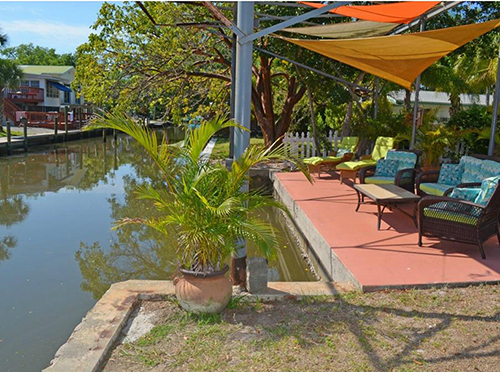 At Fort Myers Beach we found a home that is waterfront, completely furnished, and located on a large lot at just under $500,000. It is 3 bedrooms, 2 baths and is located mid-island close to shopping, supermarkets, entertainment, and marina. In Estero we located a 3 bedroom 2 bath home in Grandezza with 2,190 sq ft living area and is a former model for just under $500,000. It has a gorgeous solar heated pool and heated spa and overlooks a preserve. Again, none of the listings I this article are ours. We just wanted to give you an overview of some of the kinds of things you can find in this price range. Of course, you can find waterfront condos, homes on golf courses, and so much more. Lee County is fairly large and has lots to offer with varying neighborhoods, locations, and amenities. Because our area offers so many different types of boating, golf communities, and neighborhoods with lakes, preserves, and varying lifestyles it pays to sit down with an agent that’s familiar with the entire county and can listen to your wants and desires. At the Ellis Team we feel like we don’t have to sell anything. Rather, we listen to your needs and match you with properties that meet what you’re looking for. Some agents specialize in one neighborhood or one amenity and they struggle when people ask about other areas. Many times that buyer will come back to the original community they called on, but they want an agent who can explain the differences first so they can see if that’s really what they’re looking for. If you can’t be flexible and in curiosity when working with a buyer, chances are you’ll just lose them to another agent who can. That’s one reason why we provide all the listings on our website along with so much community data and market reports. We want buyers to feel comfortable with their purchase. It’s a big decision and some buyers are paralyzed because there is so much data and they’re afraid to make a mistake. This is where a good team can assist you. We marry the data with personal, professional advice to help you attain your dreams, and that’s all a buyer is trying to do. We take the hassle out of the buying process. If you’re a seller, you should talk to us too as we work with a lot of buyers, and chances are we may have a buyer looking for a property just like yours. If not, our marketing will surely attract attention for your home. We’ll have a few more listings coming as well as soon as we can get them ready. If you’re a buyer, call us as we may be listing exactly what you’re looking for. Posted in Cape Coral, Cape Coral Real Estate, Fort Myers, Fort Myers Beach, Fort Myers Real Estate, Gated Community, Southwest Florida Real Estate, Waterfront Homes.